Partnership: OL support a New York team! 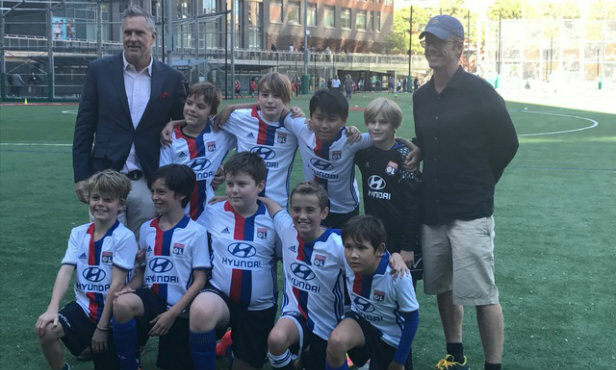 OL have provided equipment to a young New York team that represents the club in the Downtown Soccer League, a Manhattan-based competition. A thousand participants each week right in the middle of New York. For more than two months, from September till the end of November, players from a range of age categories (from under-fives to under-15s) will compete in a league using names from clubs of the the world. It is a nice nod to the various foreign leagues, including Ligue 1 and Olympique Lyonnais. This year, it is an under-11s team that will faithfully defend the OL colours. For the occasion, the club has decided to send kids’ equipment to this young team that will compete in several 60-minute matches (against Bordeaux, Lille, Marseille, Monaco, Nice, Paris and Saint-Etienne). With two training sessions per week (usually Tuesdays and Thursdays) and matches on the weekend, follow this young team that wears our colours with pride.